"I'm here to break you. This is the 13,118th time I've transferred. After so many occasions, I have to say that this is all starting to grate on me, which is why this time I'm spicing things up with a proper declaration of war." And with those puzzling words, the ordinary days that Kazuki loved so dearly become a cycle of turmoil and fear—Aya's sudden appearance signals the unraveling of unseen mysteries surrounding Kazuki's seemingly normal friends, including the discovery of mysterious devices known as "boxes." 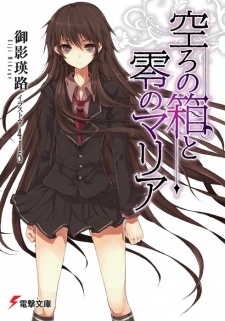 Utsuro no Hako to Zero no Maria has been published in English as The Empty Box and Zeroth Maria by Yen Press under the Yen On imprint since October 31, 2017. It was also published in Polish by Waneko from February 5, 2016 to February 7, 2017. Plainly put, this is garbage. This is the type of story writing and story telling that is killing the writing industry. It's a story disguised as a complex one, but at the core, it is simple beyond belief. The twists and turns of the plot are simply there to briefly trick you even though you've already known the outcome of a certain event. All its "complexity" just seems like the author getting new ideas and then cramming that idea into the story, realizing it doesn't end in a favorable outcome, and then finding ridiculous ways to explain why the favorable outcome was achieved. This is just over-hyped beyond belief. After an excruciatingly long time of waiting, at long last the seventh volume of Utsuro no Hako to Zero no Maria (more commonly referred to as HakoMari) has now been released, and with that it's finally time to close the lid on one of the greatest works of literature to have ever originated from Japan, and the overall best light novel I've ever had the pleasure of reading. HakoMari's story is... *unique* to say the least. It can be classified as fantasy, mystery and psychological above all else, but it really touches upon just about every genre imaginable during the course of its progression. It starts out seemingly ordinary with a typical high-school boy named Hoshino Kazuki who is extremely fond of the idea of having a so-called "normal, everyday life". But when a mysterious girl called Otonashi Aya one day joins his class, announces that it's her 13,118th school transfer and that she's here to "break him", Kazuki's life immediately becomes as far from normal as humanly possible. The plot progression of HakoMari is very difficult to explain to anyone who hasn't read it, because it's unbelievably complex and also very niche. It primarily revolves around a wish-granting device called a "box". The "boxes" are given to various people and function in different ways depending on the characters' personalities, what they wish for and also how much they truly believe in the concept of granting wishes to begin with. But either way a box can be considered a space like a fictional world which people can be trapped inside, and it operates under its own rules. In this way, effectively anything is possibly in HakoMari because all laws of normality are completely thrown out the window. I think HakoMari can be classified as "Chaos Theory". It's completely erratic, yet very systematic. It's completely irrational, yet makes absolutely perfect sense. It's abstract, yet completely logical. It messes with your head like nothing else from essentially the first sentence of the first volume and it never ever stops, but neither does it stop fascinating you with what it's capable of. The plot twists are so incredibly difficult to predict, but they always make you feel like the answer was so obvious all along once the truth is revealed. It's just that well-written, and as a result it never fails to make you smile and impress you. Almost every single volume is very different from the rest since every box operates under its own set of rules, but they still always maintain the same dark, cryptic yet incredibly captivating atmosphere. This is all possible because the writing and narration is simply superb. The author makes the readers dance to his tune like puppets with his almost cult-like writing style, and when all is said and done it's probably the main reason why HakoMari is so interesting to read. It's like trying to lay a three-dimensional puzzle in the dark, except the author is helping you by guiding your hands for you. In that way it feels like you're being presented an overall storyline that reasonably shouldn't be possible to write, except somehow it actually works out. But it's something that cannot really be explained in words alone, you have to read it for yourself. Another interesting aspect is that HakoMari has multiple protagonists. It constantly changes perspective. Each and every character is thus provided incredible depth, much more so than you would ever expect from a novel only seven volumes long in total. Furthermore, given the abnormal nature of the story itself, the different perspectives give you vastly different impressions of the flow of events. Overall, what you have is a light novel which is unlike anything else on the market, has some of the best writing I've ever seen and never ceases to amaze you with its unbelievable twists and turns. It makes you care about the characters something tremendously due to how captivating it is from the very beginning, and presents you with a storyline which is as about as close to flawless as you can possibly get. I don't think I've ever talked to anyone who's read HakoMari and didn't like it, which is something I don't think I've experienced with any other series, regardless of medium. As it is though, HakoMari is only hyped in the west, but it's basically unknown in Japan. Thus the chances of HakoMari ever getting an anime adaptation are probably rather slim, even now after the novels have finished publishing. However, I do not believe it is humanly possible to make an adaptation of HakoMari that would do the novels justice anyway, so maybe that's for the best. Either way, I'm more than happy with what we got, because it is my all-time favorite light novel and quite simply one of the overall best reads I've ever had in my life. Highly recommended to essentially everyone. "Do you have a wish?" I don't think myself able to write an objective critic to HakoMari, not while the last volume is still so vivid in my mind. As such, this is not a review, but a love letter to this wonderful novel. HakoMari is, in a nutshell, a wild ride. A crazy, reckless and downright cruel wild ride. The story, while thought out really well, is really just a container. It's the playbox where all the characters are thrown into while being told "Now do what you want". And the characters are really what makes this series so worthwhile and unforgettable. Characters who love each other but end up hurting each other. Characters who hate each other but end up realizing how much they resemble each other. All of them, unmistakably broken. HakoMari is not supposed to be a "feel-good" novel. It has the wonderful gift of being able to present characters who are hurt, broken and in despair without looking edgy or try-hard. Because at its core HakoMari is a story about many different things. And a story about "love"
They all wander clumsily through the story, while searching for their real value, their real self, their real "wish". And you are there with them, watching as they laugh, cry, and get hurt. And, before even realizing it, you too have a "wish". If you have a box that grants any wish, would you use it? Can you actually believe that something like really could exist? I assume that I was really anxious to see the end of this novel to know it and write a review. As far as I can concern, The Empty Box and Zeroth Maria (Utsuro no Hako to Zero no Maria a.k.a HakoMari) is one of the Japanese Novels that touched me most. There is the Japanese masterpiece for 21th century. Often people who follow something want a STORY to enjoy, or for enjoyable presentation, at least. Instead of deliver it, HakoMari works with epiphanies, metaphors, examples and human questions inside several somewhat big monologues. Actually they are not exactly "funny", but amazingly INTERESTING and good to make you reflect, think about yourself and people around you. The monologues are so fantastic that it can be "simple" but complex. Immature but mature. Irrational but rational. They can fit in most kinds of tastes, however it goes deeper and deeper and author isn't afraid to show the weirdest side of world. Obviously there is a story. However, this is not the most important thing. The "messages beneath the surface" are the most important thing here. Think and look forward to see it! Moreover, suspense on this is great and VERY hard to predict. It will always trick with your mind! Twists are not forced and they are very coherent, and had with little flaws (especially in last volume, as I expected). Characters are good too! They are humans. They are natural and believable! Every single character have their own personalities and thoughts, except for singular cases here and there that are minor characters. Also the side cast has their space to think, act, appear as main characters sometimes. You can love or hate someone from beginning, but your perspective could change bit a bit as you read. As someone said, "when you know someone, this person couldn't be your enemy anymore". HakoMari works with this line regarding characters and readers. Furthermore, their reactions, thoughts twists and trouble treats are the center of attention for those novels. It could help to understand better how human heads work. Illustrations are good, sometimes help to clarify some things, especially the characters physical features, but they are not so amazing and there are few pictures as many other light novels... I think it's a good point, though, since it depends heavily on words and readers imagination, so images aren't that needed at all. Because of these elements, my grade is seven for it. Oh, yes. Settings are somehow different too. Situations and plot are somewhat innovative. "Nothing is priceless" is remembered in whole novel, so you have to expect that it can be interesting with almost flawless formula. Finally I can say that this work of fiction is the prove of that depression can be productive.